Over the weekend I reorganized our spices, a project that involved transferring our dried herbs and spices into new jars. An unexpected perk of the process was the opportunity to take in the aromas of each. The wafts of cardamom seeds stayed with me through the day on Monday, and by evening I could no longer stand it; I announced that I would like to go to The American Swedish Institute for a visit to the Kaffestuga for cardamom rolls. Tom, the in-house baker, immediately asked, “What do we need? Let’s make them!” I pulled The Swedish Table by Helene Henderson off the shelf and opened to the index where I found “cardamom rolls” under the letter C. To make your own Kaffebröd med Kardemumma you’ll need sugar, water, yeast, milk, cream, butter, flour, salt, freshly ground cardamom, cinnamon, eggs, almonds and pearl sugar. Pearl sugar and almonds, the last items on the list, were not on hand, which is why the rolls look a bit bare. 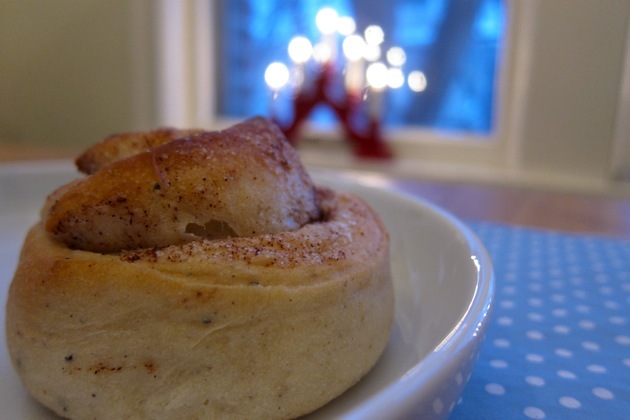 Tom went to work while I read in the living room and had the rolls ready just before bed, warming the kitchen and filling the apartment with the smells of cinnamon and cardamom. Warmed just before breakfast, the rolls made a wonderful start to a January morgon. This entry was posted by Martha on Tuesday, January 4th, 2011 at 12:16 pm and is filed under Bread, Food + Drink. You can subscribe to responses to this entry via RSS. You can’t hint at new spice jar organization without posting pictures of it/them! Being one of the few who has the opportunity to do so… come on over and check it/them out, Julia!